In the final Super Smash Bros. Ultimate Nintendo Direct video presentation before the game launches exclusively for the Nintendo Switch system on Dec. 7, Nintendo blew the lid off of many new modes, fighters and gameplay features of the massive video game crossover event, including details about upcoming DLC. Check out some of the highlights from the presentation below, as well as new photos in the gallery! During the presentation, Nintendo announced an incentive for fans to pre-purchase the digital version of the game. My Nintendo members who pre-purchase the Super Smash Bros. Ultimate game in Nintendo eShop or on Nintendo.com will earn a bonus of 300, or double, Gold Points. This limited-time offer runs now through 11:59 p.m. ET on Dec. 6. The bonus points will be issued on the game’s launch day. 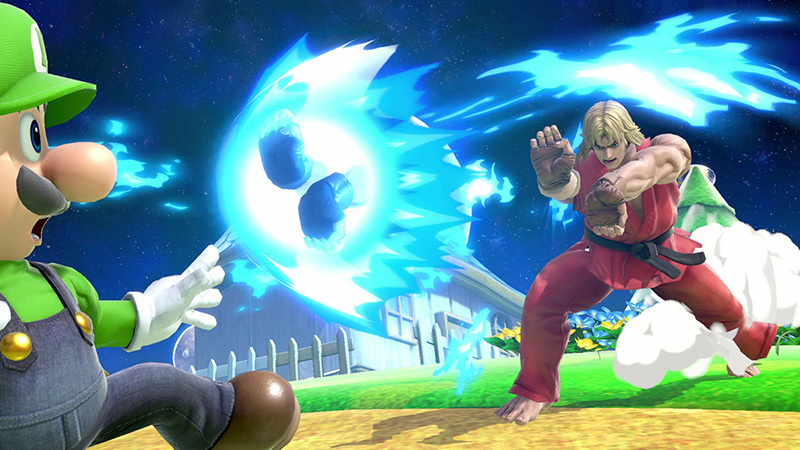 Hailing from the Street Fighter series, Ryu’s rival Ken joins the Super Smash Bros. Ultimate roster as an echo fighter. This Ken is based on his appearance in Super Street Fighter II Turbo. While he has some similar moves to Ryu, Ken is a slightly faster fighter and has a different shaped Hadoken. 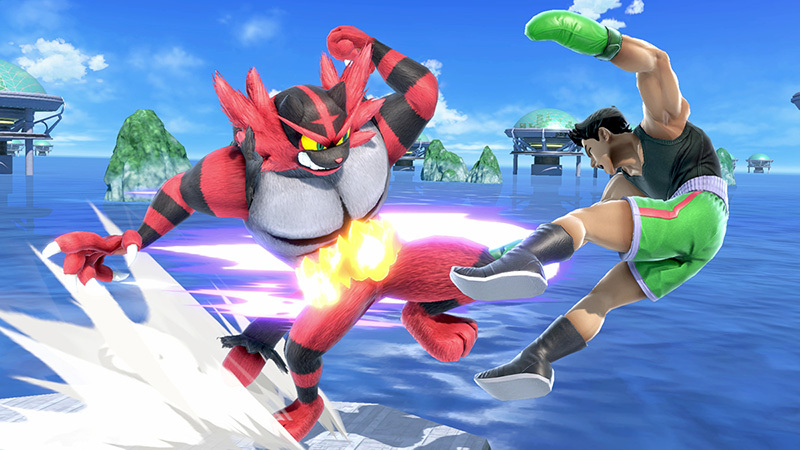 The final fighter to join the battle in time for the game’s launch is Incineroar, the advanced evolution of Litten, who made his first appearance in the Pokémon Sun and Pokémon Moon games. Incineroar uses pro-wrestling moves, culminating in an epic Final Smash called Max Malicious Moonsault, based on his Z-Move from the Pokémon games. In the world of Super Smash Bros. Ultimate, many video game characters lose their forms and become “spirits” that serve as a power-up of sorts for a player’s main playable fighter. There is a massive number of wildly different spirits, ranging from Chibi-Robo to Dr. Wily to Tails to Revolver Ocelot, with the giant list of characters going on and on. Players can equip primary and support spirits to power up or add additional abilities like speed or strength to their fighter during battles. Mixing and matching spirits will help players get the upper hand against certain opponents. The main way to acquire spirits is to win Spirit Battles. After winning a Spirit Battle, players will have to complete a roulette challenge to acquire that spirit. By battling with spirits by their side, players can level up spirits, giving them extra power and sometimes unlocking enhanced forms. The more leveled up and trained spirits are, the more powerful and useful they are. With an insane amount of spirits in Super Smash Bros. Ultimate, thousands of combinations can be formed. Players will be constantly surprised and excited by all the spirits that pop up in the game. Because players might collect an abundance of spirits, the game will offer recommendations for primary and support spirits, making the selection process a little bit easier. 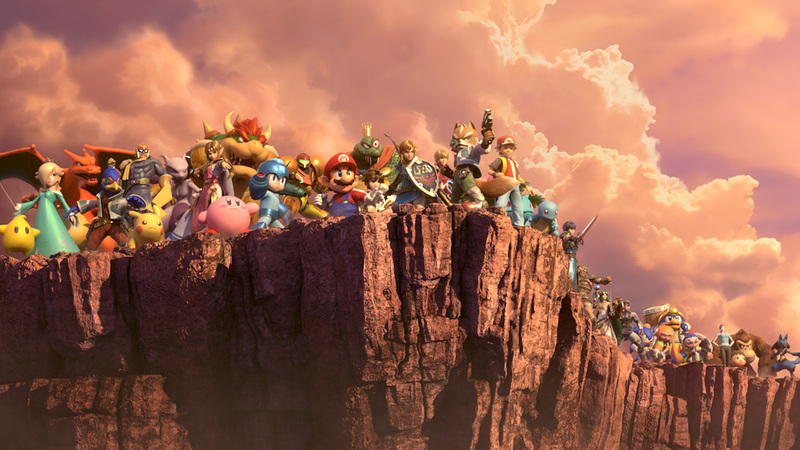 New fighters, stages, and music will be coming to Super Smash Bros. Ultimate through the end of February 2020 in the form of paid DLC. For only $5.99, players can purchase one set, which includes a new playable fighter (not an Echo Fighter), a new stage and a variety of music tracks. By purchasing a Fighters Pass for $24.99, players will get access to five yet-to-be-announced sets, which is five new fighters, five stages, and multiple music tracks, as they release. Players who purchase a Fighters Pass will also receive an in-game outfit based on Rex from Xenoblade Chronicles 2 starting Dec. 7. Pre-purchasing the digital version of the game with the Fighters Pass in Nintendo eShop or on Nintendo.com before 11:59 p.m. ET on Dec. 6 will earn My Nintendo members 425 bonus Gold Points, or double the usual amount. The bonus points will be issued on the game’s launch day. Piranha Plant, the iconic enemy from the Super Mario series, is coming to Super Smash Bros. Ultimate for early purchasers. Players can purchase the digital version of the game or register their physical game card on a Nintendo Switch device by Jan. 31, 2019, to gain access to this new fighter when it is available around February 2019 at no additional cost. Piranha Plant, together with a new stage and music tracks, will be available for purchase as DLC in the future. Fans can pre-purchase the game and secure the Piranha Plant reward starting today by visiting SmashBros.Nintendo.com. All the new fighters in Super Smash Bros. Ultimate — including the DLC — will get their own amiibo figures. This includes Ken, Incineroar and Piranha Plant, as well as the recently announced Simon Belmont and King K. Rool. Inkling, Ridley, and Wolf will release on Dec. 7, 2018; King K. Rool, Ice Climbers, and Piranha Plant will release on Feb. 15, 2019; and Isabelle, Pichu, Ken, Young Link, and Daisy will arrive in 2019. Adventure Mode: World of Light: There may not be a single-player adventure quite like Adventure Mode: Subspace Emissary from Super Smash Bros. Brawl, but something has caused the numerous video game characters in the game to lose their bodies and transform into spirits. Masahiro Sakurai, the director of the Super Smash Bros. series, is keeping parts of this new adventure mode secret until the game launches. In Super Smash Bros. Ultimate, assist trophies help players in battle. Each assist trophy is based on a recognizable video game character and unleashes a variety of different powers, both offensive and defensive. The total number of assist trophies in the game is 59, representing characters like Guile from the Street Fighter series, Isaac from the Golden Sun RPGs, the Fly Swatter from Mario Paint and Spring Man from ARMS. When playing as a Mii Fighter, players can customize their outfits and voice options. Some new Mii Fighter outfits have also been added to Super Smash Bros. Ultimate. Super Smash Bros. Ultimate lets players battle together with friends and family members via local wireless or online. “For Fun” and “For Glory,” which existed in Super Smash Bros. for Wii U and Super Smash Bros. for Nintendo 3DS, are no longer options. Instead, matchmaking is based on three factors: Preferred Rules, which lets players choose their rules for battle and pair up with others with similar preferences, Global Smash Power, an online leaderboard that pits players against others with a similar score, and Proximity, players who are close to each other geographically. Two-Player Co-op will also be available, allowing two players to team up on one Nintendo Switch system online to take on other teams with the same setup. With the Nintendo Switch Online app on smartphones, players can voice chat with others in battle arenas. A mobile service called Smash World is also being developed. Instead of focusing on stats, the new service allows players to post and watch videos, as well as other fun features. More details about the service will be revealed in the future. Once a player’s Global Smash Power is high enough, they will be invited to compete in elite in-game battles. These VIP matches are for the best of the best and offer some serious competition. Everyone who competes online will need to create a unique Smash Tag. By beating a fellow fighter, players will receive their Smash Tag to display on their profile. Online play also offers pre-determined short messages, Spectator Mode where players can watch other players battle, background matchmaking, and custom battle arenas. Other features and settings include the Mob Smash, a mode that lets players battle an army of fighters in different stages, replay, challenges, battle records, custom balance, and early hands-on events where players will have the chance to choose from all 74 fighters. Details about upcoming hands-on events will be listed on the game’s site. The post New Super Smash Bros. Ultimate Details Released appeared first on ComingSoon.net.